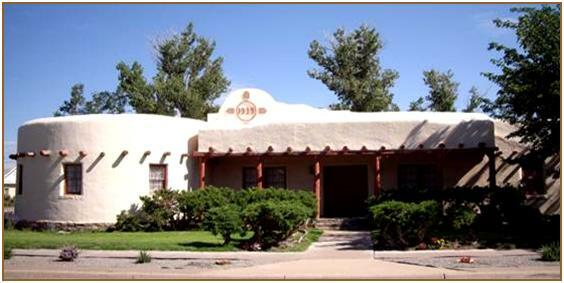 Beside the Masonic Building is an outstanding example of Pueblo Revival Architecture built for the Woman's Club in 1939 by the WPA. Members of the Club financed the construction and land purchase by selling bonds and holding fundraising events. Built of adobe, the interior circular room boasts an unusual log ceiling in the shape of spokes of a wheel. The logs to make these vigas were hauled in from the Capitan Mountains. The Woman's Club still owns this property, which was added to the State and National Registry of Historic Properties in 2003, and uses it for their meetings and community events.